Kilkenny's TJ Reid gets away from two Wexford players. KILKENNY MIGHT HAVE lived in Wexford’s shadow in recent times, but TJ Reid brought the Cats roaring back to supremacy when putting the neighbours to the sword with a terrific personal haul of 0-15 in Easter Sunday’s Allianz Hurling League Division 1 semi-final at an Arctic-like Innovate Wexford Park. Wexford promised much when producing explosive starts to either half, but the visitors out-mastered them for the remainder of a frenetic tie to comfortably negotiate through to their first league final since last claiming the top-flight title in 2014. And now on the back of a five-match winning streak after a troubled start to the league, Kilkenny will be relishing the prospect of locking horns with Tipperary in the decider next weekend. For Wexford, they were exposed in far too many departments on this occasion and are left with much to ponder ahead of the Leinster championship, in which they renew derby rivalry with Kilkenny on 9 June. 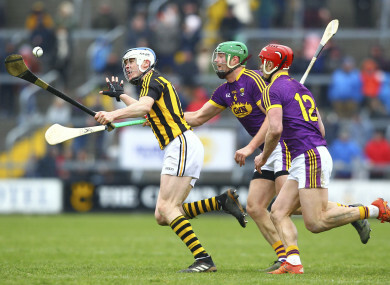 But, having beaten Kilkenny in three of four meetings within the past year, Wexford would have been encouraged for their chances of avenging March’s group-stage loss to the Cats as they sped into a 1-2 to 0-1 lead after seven minutes despite facing the strong wind. The sides exchanged opening scores before a second pointed free from Rory O’Connor was followed by the teenager being impeded at the expense of a penalty. And, just like in the Tipperary match, Aidan Nolan netted from the spot as Wexford appeared to be getting their claws into Kilkenny before the attendance of 16,542. But the purple-and-gold fell strangely flat after that stirring opening as they were subsequently outfought by the wind-assisted visitors. Kilkenny responded very much in the affirmative, and despite being foiled with a goaling effort, they charged into a 0-12 to 1-2 lead after 27 minutes as TJ Reid (5), John Donnelly (2), Bill Sheehan, defenders Enda Morrissey and Cillian Buckley, goalie Eoin Murphy from a monstrous free, and Richie Leahy had the Cats purring. And Brian Cody’s men had Wexford in serious bother when Walter Walsh stole in from the right on 32 minutes to angle a drive to the net to complete a stunning 1-12 to 1-2 transformation. Wexford eventually ended their 25 minute scoring drought when Rory O’Connor stroked over on 32 minutes the first of three late frees as the Davy Fitzgerald’s shocked charges got to the refuge of half-time down 1-13 to 1-5, but only after Shaun Murphy blocked a last-gasp goaling attempt by Ger Aylward. Thunderous cheers pierced the air though as Wexford resumed with gusto. Stimulating points from Conor McDonald and Rory O’Connor (2) lifted the home support before McDonald collected a delivery from Matthew O’Hanlon and shook off his marker to rifle the net to stir things up after 39 minutes, leaving it 1-14 to 2-8. But Kilkenny put the dampeners on the Wexford upsurge when claiming seven of the next nine points to reassert control by 1-21 to 2-10 after 59 minutes as TJ Reid led the way with four points, including three frees. And there was simply no letting up from the Ballyhale Shamrocks’ man as he continued to put distance between the sides as Kilkenny stretched ahead by eight points after 63 minutes. Despite the excellence of Rory O’Connor, who claimed 0-12, Wexford just couldn’t regain a foothold in the game as Kilkenny stormed through. Scorers for Kilkenny: TJ Reid 0-15 (11f), Walter Walsh 1-1, Richie Leahy, John Donnelly, Ger Aylward 0-2 each, Eoin Murphy (1f), Cillian Buckley, Enda Morrissey, Martin Keoghan, Bill Sheehan 0-1 each. Scorers for Wexford: Rory O’Connor 0-12 (8f), Conor McDonald 1-1, Aidan Nolan 1-0 (penalty), Shaun Murphy, Harry Kehoe 0-1 each. Email “TJ Reid inspires Cats as victory over Wexford seals progress to Division 1 final ”. Feedback on “TJ Reid inspires Cats as victory over Wexford seals progress to Division 1 final ”.